As your travel adviser, it's my job to find your next dream destination and the best travel companies that'll take you there. With that in mind, Celebrity Cruises has a lot in store and I have feeling you're gonna love every bit of it. Instead of me telling you all the details, I thought you should hear it directly from them. 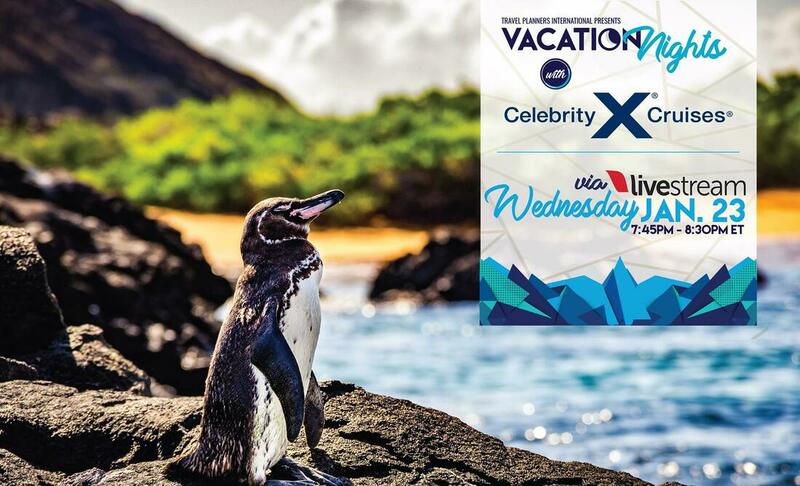 Join me and Dave & Gloria from Celebrity Cruises for Vacation Nights, a virtual cruise night! This is a great opportunity to really learn more about Celebrity Cruises and ask Dave & Gloria all your questions. Best part? It's all LIVE and you can watch this from the comfort of your own home. Tune in on January 23 at 7:45pm ET and make sure to stay until the end as Dave & Gloria will announce exclusive deals that won't be available anywhere else! Click the button below to sign up for this free event. On the night of Vacation Nights, watch live via Livestream.com. Feel free to ask Dave & Gloria all your questions. I'll be available all night to answer any other questions and start booking your next vacation!